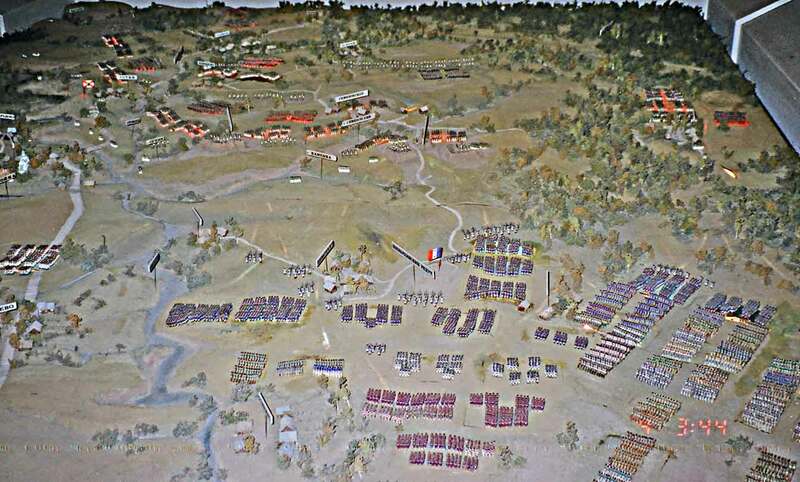 In this view of the diorama we are almost over the French headquarters and Napoleon, shown by the French flag just to the right of center part way up the photo. The French army is deployed with Old Guard around Napoleon and masses of French and allied reserve cavalry to the right lower part. Borodino church is at the left edge just across the New Smolensk Road. Gorki is above it. The Rayevski battery appears to the right of Borodino and across the stream with masses of Russian infantry on both sides. The Bagration fletches can be seen well in this view directly above the French flag with a path leading between them.